BANDANA PIRATE. 100% coton -Taille: 55 X 55 cm - NEUF. A défaut, nous ouvrirons un litige. ✿ BANDANA TETE DE MORT ✿. Skull Bandana. Size : 56cm x 56cm. Bandana Tête de Mort. N’oubliez pas de m’ajouter à votreliste de favoris ! Expédiés de France sous 24h ( sauf le week-end) -. (Lettre Prioritaire avec suivi disponsible). 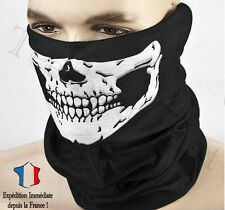 Voici un bandana Couleur : Noir avec impressions en blanc - beige. Envoi rapide et soigné avec numéro de suivi (dans le cas d’un envoi en colissimo). Très bonnes enchères à tous ! Size : 56cm x 56cm. Bandana Tête de Mort. Skull Bandana. (Lettre Prioritaire avec suivi disponsible). N’oubliez pas de m’ajouter à votreliste de favoris ! Expédiés de France sous 24h ( sauf le week-end) -. Ce bandana en tissu est pour adulte (perruque, cache oeil et boucle d'oreille non inclus). Bandana Têtes de mort. 100% COTON. Je vous propose un bandana neuf avec étiquette. Bandana,Skulls,Shaped do du rag cap bandanna zandanna hat biker motorcycle white. Sear ch w ords= Bandanna Zandana Zandanna Du Doo Do Rag Head Scarf Wrap Skullcap Skull Cap Hat Flydanna Flydana shaped fitted Ready Tied Tie. Ready Tie Bandana This bandana has darts to create a nice head shape and has a double stiched band that runs around the base. There is a fabric flap that runs down the back of the neck over which the tie is done up. The easiest way to wear a bandana wothout the hassle of fancy folding. One size fits most NEW with tag 100% cotton Great for the beach!. 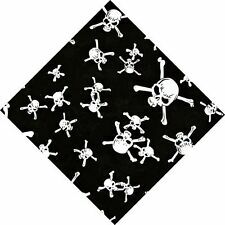 Bandana with skulls and scissors on colour black and white abd red size 21.". squareThese are of great quality. 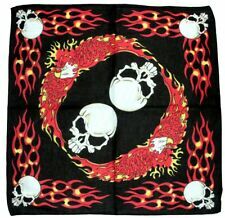 Bandana with skulls on and fire on colour black background and multi col size 21.". squareThese are of great quality. 100% Cotton Pirate Skull and Crossbones Bandana. Style: Bandana. Blue Banana is proud to present this fantastic addition to our collection. Finish: Paisley/Check Skull Print. Colour: Black. Fancy Dress. Fabric Composition: Cotton. Size Information. Style: Bandana. Blue Banana is proud to present this fantastic addition to our collection. Finish: Skull Wire Print. Fancy Dress. Fabric Composition: Cotton. Colour: Black. Size Information. Bandana / Neck head scarf / Du-rag. SKULLS AND RED BANDANAS. Real leather gorgeous cap. Head size can be adjusted from the tiers at the back. Made from soft sheep leather. One size fits the most. New Unused Black And Gold Skullcandy Bandana. Bandana / Neck head scarf / Du-rag. SKULLS AND ROSES. Bandana / Neck head scarf / Du-rag. MULTI COLOURED SKULLS. LAUGHING SKULLS AND GRAFFETTI. bandana / Neck head scarf / Du-rag. Bandana / Neck head scarf / Du-rag. Nouveau coton blanc petit crâne & crossbone bandana / foulard / chiffon du 20 "x 20"
SMALL SKULL & CROSS BONE Bandana /. Du Rag/ Scarf. Bandana / Neck head scarf / Du-rag. GOTHIC SKULL, SPIDER, SPIDER WEBS & GHOST. 100% COTTON. BLACK BACKGROUND WITH WHITE DESIGN. Bandana / Neck head scarf / Du-rag. WHITE PAISLEY PIRATE SKULL AND X BONES. 100% COTTON. Noir Avec Rose Crânes Tête Foulard/bandana 40 X 40"
HEAD SCARF OR LARGE BANDANA. Gorgeous high quality Bandana. BLACK WITH PINK SKULLS. Sear ch w ords= Bandanna Zandana Zandanna Du Doo Do Rag Head Scarf Wrap Skullcap Skull Cap Hat Flydanna Flydana shaped fitted Ready Tied Tie. Ready Tie Bandana. This bandana has darts to create a nice head shape and has a double stitched. Noir Avec Violet crânes tête Foulard/Bandana taille 40 X 40"
HEAD SCARF OR LARGE BANDANA. Gorgeous high quality Bandana. BLACK WITH PURPLE SKULLS. 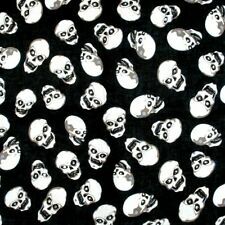 Bandana with skulls on colour black and mult coloured skulls size 21.". squareThese are of great quality. Buffalo Dreamcatcher Bandana. Full Size Image Shown of bandana. Great print of Buffalo Skulls with a native red indian designs. It may cost a little more. Noir Avec Bleu Crânes Tête Foulard/bandana 40 X 40"
HEAD SCARF OR LARGE BANDANA. Gorgeous high quality Bandana. BLACK WITH BLUE SKULLS. TRIVIUM T SKULLS LOGO BANDANA. TRIVIUM SKULLS LOGO DESIGN ON A BLACK BANDANA. Mauve Avec Noir Crânes Tête Foulard/Bandana 42X42"
Size 42X42" 107 X 107 cm approx. HEAD SCARF OR LARGE BANDANA. Gorgeous high quality Bandana. Bandana / Neck head scarf / Du-rag. LARGE SKULL AND CROSSED BONES. 100% COTTON. MIAMI JAK SKULL AND BIRDS. bandana / Neck head scarf / Du-rag. Bandana / Neck head scarf / Du-rag. BLUE WHITE AND RED SKULLS ON BLACK. Bandana / Neck head scarf / Du-rag. BLUE WHITE AND GREY SKULLS ON BLACK. Bandana / Neck head scarf / Du-rag. RED,BLACK AND WHITE SKULL,CROSSED SWORDS. 100% COTTON. Cotton / Polyester. 54cm x 54cm. Bandana / Neck head scarf / Du-rag. SKULLS CROSS BONES AND FIRE. 100% COTTON. Bleu Avec Noir Crânes Tête Foulard/Bandana 42X42"
Size 42X42" 107X 107 cm approx. HEAD SCARF OR LARGE BANDANA. Gorgeous high quality Bandana. Bleu Pâle Avec Noir Crânes Tête Foulard/Bandana 42X42"